← Meat Free + Yoga for 30 Days with BexLife! So if you missed yesterday’s post I am joining a 30 day Plant Based Diet challenge hosted by BexLife and Danielle Diamond! You can check out the details and video here. During the next 30 days I will sharing tips, recipes and facts about plant based eating and living, too. There are huge benefits that are directly related to cutting back your animal product consumption; and I am not only talking about your health here. The environment suffers from animal farms as well as the animals themselves. This is a huge topic that I am planning on tackling over the next 30 days. So on to my eats! I was not feeling well at all yesterday. I was extremely tired, no energy and I felt very warm. I also had a very bad neck ache which didn’t didn’t help my situation either. I did some light stretching in the morning but that was the extent of any kind of exercise. I did however muscle of the energy to clean the house yesterday – slowly but surely! For breakfast I was craving cereal. I normally do not eat cereal for breakfast but this morning I was feeling it! 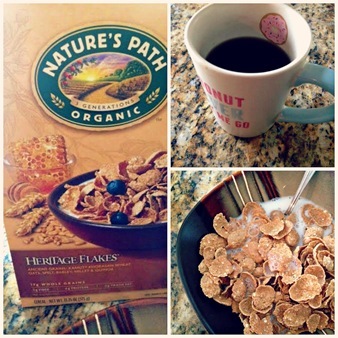 These Heritage flakes are very good with unsweetened almond milk! They have ancient grains such as spelt, barley, millet and quinoa. 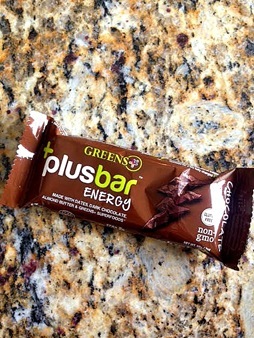 From 12-1 I nibbled on a Greens + bar. These are very good (peanut butter is my favorite!) and I picked them up at Trader Joes. I sat down to do some client and computer work for the rest of the afternoon before Jordan came home from school. I was feeling a tad better but not much. 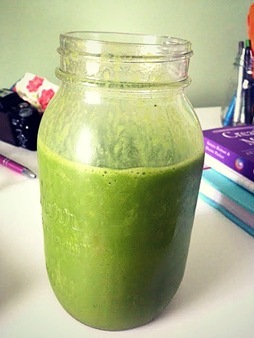 At about 2:30 I made myself a green protein smoothie – it had spinach, frozen banana and peaches, Vega protein powder, stevia, unsweetened almond milk and water. I actually didn’t want to drink it but I knew I had to get some fuel in me. I am so glad I did because I started to feel MUCH better afterwards! I started to gain my appetite back towards the evening and I am so glad I did! 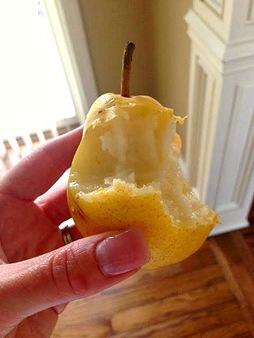 I got home at about 4 from picking Jordan up from school and we both snacked on a juicy pear. We had plans to go to a play at 7 so we needed to have an early dinner. 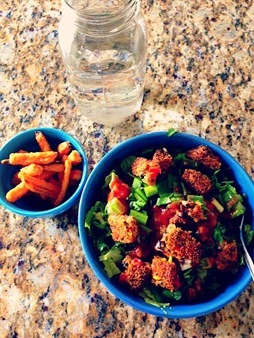 I ate at about 5:30 – I made a large salad topped with a veggie burger and a side of sweet potato fries. This salad was amazing! Romaine lettuce, cilantro, yellow bell pepper, avocado, green onion and topped with salsa. 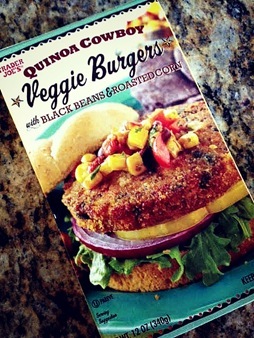 I crumbled up a cooked veggie burger – these are currently my favorite! They are not vegan (they have egg whites in them) but I am OK with that. I would rather eat what I have on had than to waste it. There are some amazing quinoa burger recipes on pinterest that I will be making once I use the last one of these up! 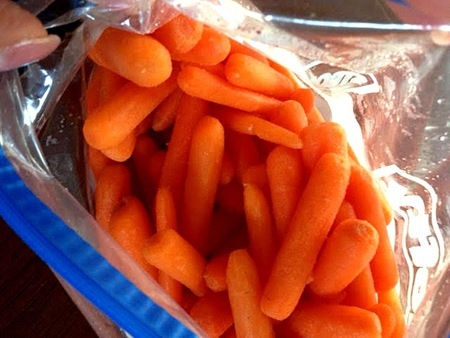 I also had some baby carrots. I was HUNGRY! After we returned home from the play I was a little hungry so I had another bowl of cereal – I didn’t take a picture of it, though. So there you have it! A day in the life of a veggie! I will add that I am NOT counting calories or restricting myself in the least. 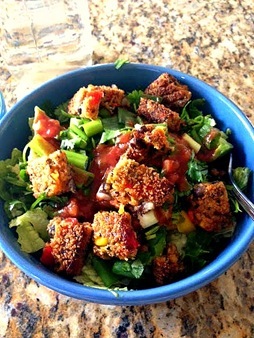 What I love about eating a plant based diet is that you can eat in abundance and feel fantastic! I have had times in my life where I was restricting myself and they were very hard and dark times for me. I had a very bad relationship with food and an unhealthy view about my body. So you will not find me counting calories or worrying about that kind of stuff these days. Especially when I eat clean and mostly plants. I did weigh myself at the beginning of this challenge and will again about the 30 days is up because I am always curious how my body reacts to changes in my diet. I may or may not be sharing simply because I don’t want people to think this is a form of dieting. I will say that when I was eating a strict plant based diet several years ago I was my healthiest – that is my goal today. To feel and be healthier! 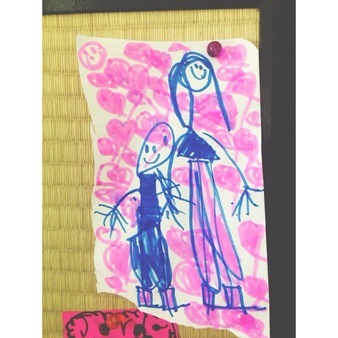 This entry was posted in 30 day challenge, vegan, vegetarian. Bookmark the permalink.